Ingredients: Chicken breasts (about 1-2 pounds), chicken broth, one jar of pineapple ice cream topping, and one jar of medium chunky salsa. Cook the chicken breasts in about 2 cups of chicken broth for about 4 hours on high. Drain the excess broth from the slow cooker, leaving just a little bit in the bottom. 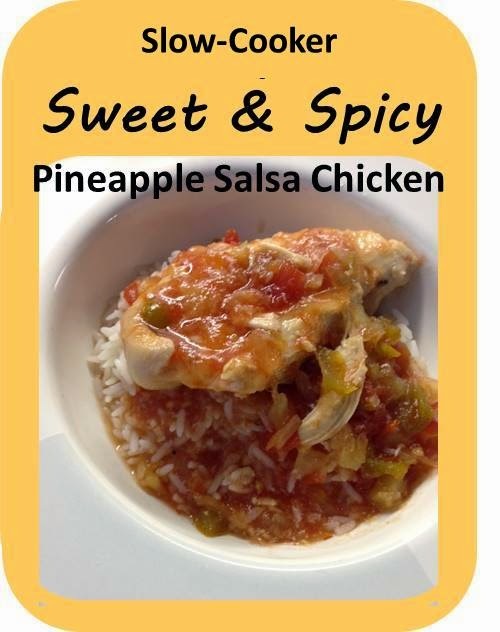 Mix together the pineapple topping and salsa, pour it over the chicken. Cook for another 30-45 minutes. I served this over rice with lots of the sweet and spicy sauce. The dish reminds be a bit of chicken cacciatore - sweet but with that nice little kick of pepper flavor. ﻿For a side, I'd recommend a simple romaine, cucumber, and cheddar salad with a ranch dressing.